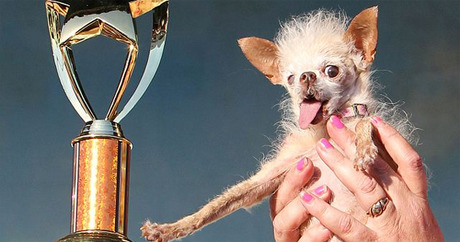 Yoda winning the World’s Ugliest Dog Contest in 2011; she beat 30 competitors for the title. Some say she had a face only a mother could love, but today the dog world is remembering Yoda. Yoda, the winner of the 2011 World’s Ugliest Dog competition, passed away in her sleep on March 10. The Chinese Crested–Chihuahua mix was 15-years-old at the time of her death. Owner Terry Schumacher of Hanford, California, announced Yoda‘s passing in an e-mail to the Hanford Sentinel. Schumacher found the abandoned Yoda in a field behind an apartment building 14 years ago, and she had been a part of the family ever since. Because of the dog’s unusual appearance, Schumacher first thought the pooch was a rat. When she claimed the title of “World’s Ugliest Dog” in June, 2011, Yoda weighed in at an itsy-bitsy 1.8 pounds. A Chinese Crested mix, her small frame was speckled with sparse patches of fur. Her crooked nose and peewee size made her a crowd favorite in the Mutt category. Yoda went on to beat 29 other worthy competitors to win the Ring of Champions round. Event producer Vicki DeArmon told the press that Yoda will retain her title, even in death. A new winner will be chosen at the contest this summer. The World’s Ugliest Dog Contest has been held annually at the Sonoma- Marin Fair for going on 24 years. This year’s competition will kick off June 22nd, 2012 at the Sonoma-Marin Fairgrounds and Event Center in Petaluma, CA. The dog was named after the Jedi master charecter that appeared in all but one of the Star Wars movies.